Breathtaking landscape, unique wildlife, atmospheric Buddhist monasteries and warm people make the travel to pristine Spiti an out of the world experience. No wonder Rudyard Kipling called Spiti - a world within a world. Spiti, literally meaning "the middle land" i.e., the land between India and Tibet, is a cold desert. Read on for places to see, best time to visit, how to reach, weather, and lot more! Jan-April: Spiti is covered in a thick layer of snow, and Kunzum pass is blocked. This is the best time for trying your luck in spotting snow leopard in White Spiti. June-Sept: With temperatures getting pleasant, and Kunzum pass getting cleared, the Spitian life is back in action. Best time to visit Spiti. Breathtaking landscape, unique wildlife, atmospheric Buddhist monasteries and warm people make the travel to pristine Spiti an out of the world experience. No wonder Rudyard Kipling called Spiti - a world within a world. Spiti, literally meaning "the middle land" i.e., the land between India and Tibet, is a cold desert. 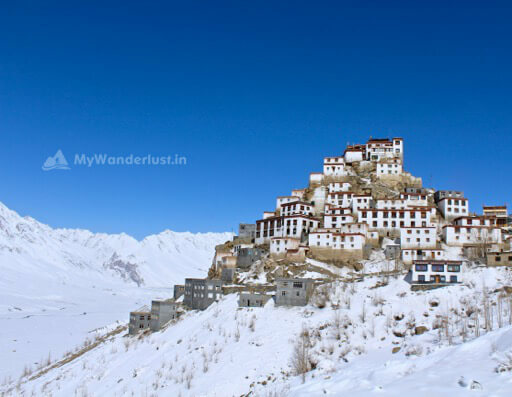 Read on for places to see, best time to visit, how to reach, weather in Spiti, and lot more! Jan-Feb in Spiti is the peak winters with the whole valley covered with a thick layer of snow and roads often being blocked for days. The white Spiti at this time is a surreal experience, if you're ready to brave the extreme cold. Depending on the snowfall, March is probably a better time to see white-Spiti as many homestays and guesthouses start opening and weather starts becoming relatively better. Come April and the snow starts melting with day temperatures starting to rise. June-Aug is the time when you see a change in scenery with green fields almost everywhere providing a stark contrast to the desolate mountains on either side. This time sees monsoon arriving in most other parts of the country and with raining cats-and-dogs everywhere else, it's a peak tourist season in Spiti. Spiti, lying in the rain shadow of the Himalayas, receives little to no rainfall. Sept onwards is a dry season and you find Spiti starting to go into hibernation as most of the workers in hotels and restaurants, and even some locals start leaving for the lower regions of Himachal or elsewhere, for the winters. Spiti has no air or railway connectivity. It's connected to the outside world by road from Manali side via Rohtang and Kunzum pass, and from Shimla side via Kinnaur. Kunzum pass remains snowbound for about 6 months, and so Shimla-Kinnaur route, which remains open round the year (subject to temporary closures due to landslides or heavy snowfall), is the only possible option to visit Spiti during the winter times. 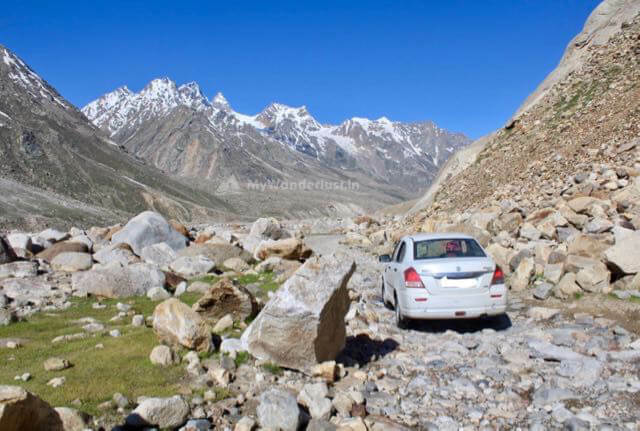 Spiti circuit is a very popular route for road trip and if you don't mind driving for long stretches amidst some of the worst roads of the world, this journey whether it's made with a bike or car can be a very rewarding experience! Foreigners need an Inner line permit to visit Spiti while coming from Kinnaur. To reach Spiti from Delhi, one can take a bus to Reckong Peo (Multiple buses including one direct Delhi-Peo ordinary bus (INR 800) and other delux buses till Chandigarh, Shimla or Rampur are there). From Reckong Peo there is a Kaza bus which starts at 7am and goes via Nako and Tabo reaching Kaza (INR 340) at about 5pm. This being the only option before Kunzum pass gets cleared of snow sometime in June. When Kunzum pass is clear (June-Oct) another option that opens up is to take a bus to Manali and then reach Spiti from Manali. There is a bus to Spiti from Manali which starts early morning (6 am) reaching Spiti later in the evening. There are shared taxis as well which operate during similar times, which are usually more comfortable and take lesser time but are more costly (~Rs. 1000/pax) than the public bus. If you like having your space and don't mind paying more, then you can also get private taxis in Manali which charge approx. Rs. 5000 for a drop to Kaza. There are no overnight buses anywhere in Spiti region. Bus to and from Manali operates between mid-June to mid-Oct only. Gramphu to Kunzum stretch of road (about 3 hrs) is perpetually in a bad shape. 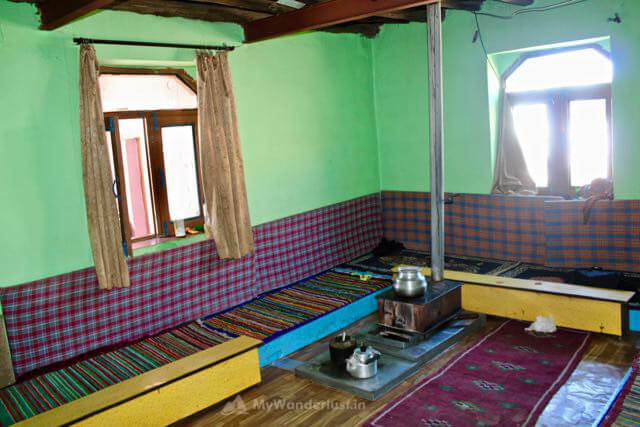 The best way to get a close look at Spitian life is by staying in the homestays, which have been setup in several villages including Langza, Kibber and Komic on the east side of the Spiti valley. All of them are beautiful villages set amidst pristine desolate beauty with similar looking box shaped whitewashed houses made of mud-bricks surrounded by Buddhist prayer flags. The warm hospitality of the homestay folks makes for an experience worth remembering. They serve amazing food as well, usually eaten sitting with the host family in front of a fireplace in the traditional kitchens. It could be freezing outside but very warm inside. If your taste buds crave for some local food, there isn't a better place than a homestay. The price, per person per night, is around INR 500-800, that includes two or three meals. The life in the remote Spitian villages is not easy (as you might observe during your stay), so we recommend not to haggle over the price at homestay. Frequently seen growing naturally in high altitude arid areas of Spiti you'll find this shrub with small golden fruit which is very nutrient rich especially having an extremely high content of Vitamin C. While in Spiti, ask for this wonder fruit (Seabuckthorn is mainly served as tea or juice) and enjoy its health benefits! It's also possible to stay in the Key monastery (and there are homestays near Dhankar monastery as well), if you want to see the monastery life and rituals up-close.